Alicia Keys' Returns With Sprawling Love Song, "Raise A Man"
From Alicia Keys to Dan + Shay, watch all the 2019 Grammy performances. 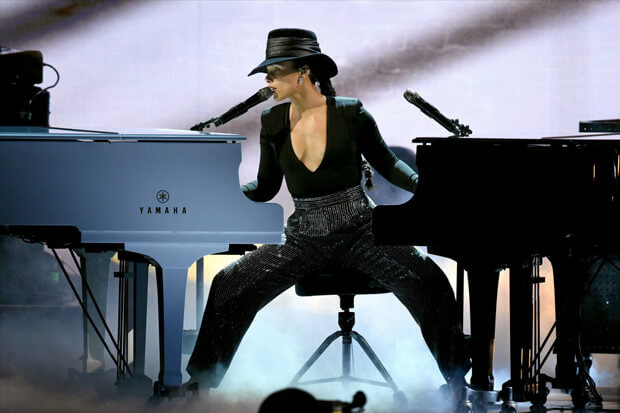 Alicia Keys’ profile is sky-high after hosting the 2019 Grammy Awards (and delivering a show-stealing performance). Never one to let an opportunity slip through her fingers, the R&B icon found the time to roll out a new song just in time for Valentine’s Day. “Raise A Man” captures the 38-year-old at her most experimental. She writes a sprawling, six-minute love letter to her husband over a loose piano arrangement. It doesn’t soar as high as “No One” or cut as deep as “Fallin’,” but the ballad is not without its charm. “I’m just not like these other girls I swear, I just have to love you,” Alicia sings in an early verse. “I just wanna need you if that’s ok, and your just not like these other men out here — you just wanna hold me and that’s ok.” In fact, the lyrics seem to recount the early days of her romance with Swizz Beatz. As such, there’s a degree of hesitation (he was married to someone else at the time), but it’s gone by the chorus. “Show me your hand, boy if you understand,” she sings. “Somebody Raised a Man.” Listen below.